It was obvious that we came across with an architectural masterpiece. There was an inscription on the top of the huge building saying: Mikimoto. For me as an architect-jewellery-designer it was the ‘all-in-one’. I admit that my heart began to beat heavily like at a first date. We did not need more, we entered the building immediately. 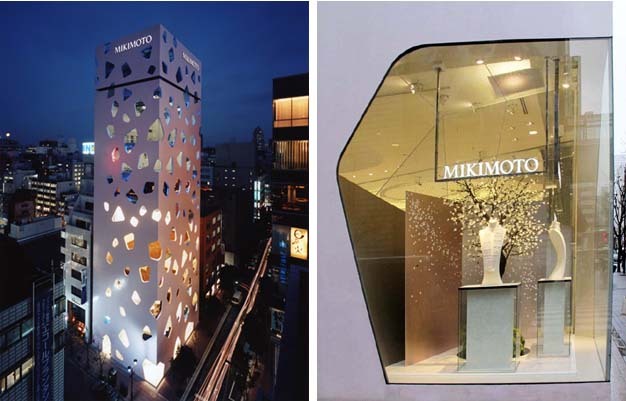 Mikimoto is a famous jewellery house in Tokyo and it can be found in the major cities of the world. Mikimoto has become world famous with reason: Kokichi Mikimoto, the founder of the brand, was born in 1858 and dedicated his whole life for culturing the perfect Akoya oyster pearls. He has invested a lot of time, energy and money in this profession. He succeeded in culturing the most beautiful pearls in the world after several serious failures. The first Mikimoto Pearl Store was opened in Ginza in 1899 and in the same time the name became a symbol of Japanese Culture. Mikimoto recognized the importance of jewellery design really early, and it is reflected on the development of Mikimoto style as well. Why is Mikimoto Ginza building so special? There is no doubt that it’s a fantastic building! Toyo Ito, the famous Japanese architect designed the building as it was a jewellery box. The building is basically a rectangular box; however the façade is very exciting with irregular holes which appear as bubbles on clam shell. The 9 storey building (+ basement) has got steel and reinforced concrete structure with a total of 2.205m2 floor area. The four façade elements cover the structure as light shells. When you enter the Mikimoto Ginza 2 Jewellery Store, you arrive at a unique and elegant showroom. Then going upwards, different types of jewellery can be found on different floors. Special high class jewelleries are exhibited on one floor, where mostly kings and billionaires purchase jewelleries. However, we have received a warm welcome as enthusiastic visitors in the Jewellery House. Hajime, the store manager showed us around and showed us the beautiful jewelleries. He told us stories about Mikimoto, his pearls and his jewelleries with oriental politeness and hospitality. The shine of Akoya pearls was so magical that I looked at each piece of jewellery with girlish excitement. I can admit that it happens to me very rarely nowadays. After such a beautiful experience it is not surprising that I was inspired by pearl jewelleries. If you are interested in my pearl collections, discover them at the gemstones-pearls page on my website. Some of the building photos are made by myself. For more photos and for presentation of the jewelleries visit Mikimoto’s Homepage. Find the drawings of the building here.